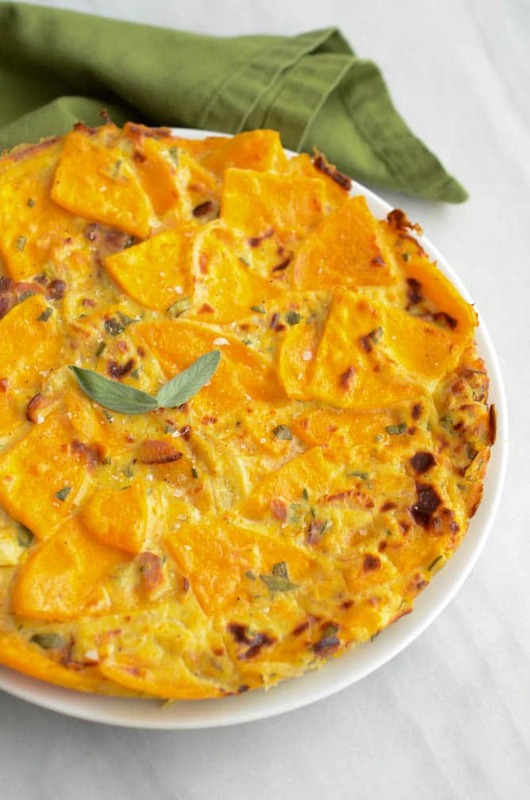 A classic Spanish tortilla with a fall twist, featuring butternut squash instead of potatoes, creamy goat cheese, fresh sage and crispy bacon. 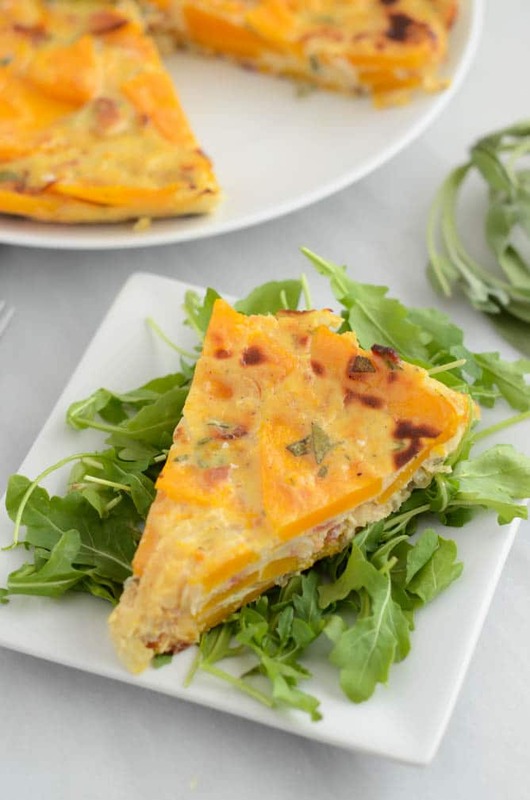 This Butternut Squash, Bacon and Goat Cheese Spanish Tortilla has been on repeat in our house lately and, since I’ve made it so many times that I practically know the recipe like the back of my hand, I figured it deserved a solid mention. As you may or may not know, I also have a culinary consulting business in addition to this here blog, Celebrations by CaliGirl Cooking. One of my clients from the very beginning has been the hotel I used to work at, and I bring baked goods and other treats in for them for various meetings, birthday parties, etc. 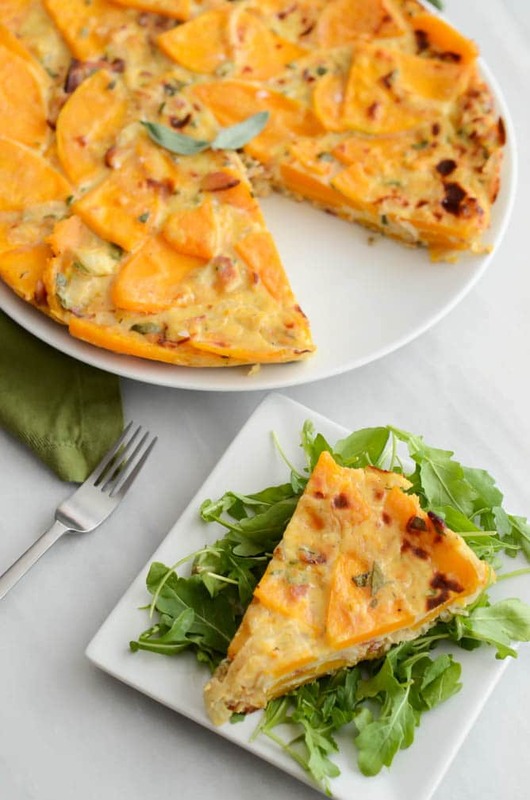 This recipe is a riff off of my Smoked Salmon and Fresh Herb Spanish Tortilla that I made a while back, but this time utilizing some of the best fall produce. Spanish tortillas traditionally use potatoes as their starchy base, but since I had an abundance of squash hanging around, I decided I’d give sliced butternut squash a shot. I’m so glad I did! It cooked up just beautifully, and feels even a little bit lighter than the starchier potatoes would. We all know that goat cheese is a natural pairing for butternut squash, and for the fresh herbs I reached for fresh sage (the “it” herb of the season) plus a little bit of fresh thyme. For protein, I decided the salty crunch of applewood smoked bacon would be the perfect contrast to the sweet butternut squash and rich, tangy goat cheese. 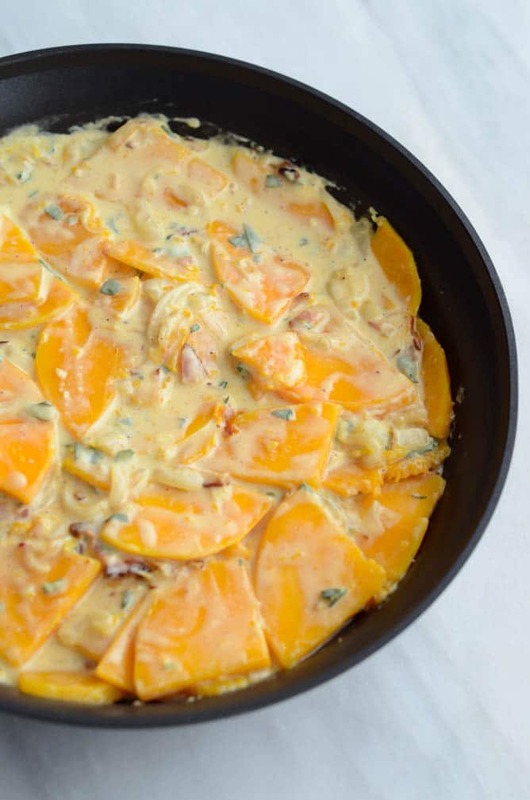 I also love that this recipe comes together fairly quickly (you can even prep the squash, onions and bacon the night before,) and it holds up incredibly well. I made this a day before we left for our parents’ houses over Thanksgiving, and it was the perfect, easy breakfast to reheat the morning of Turkey Day so we didn’t have to worry about slaving over anything but the big bird we’d be enjoying later that evening. 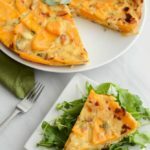 Yes, this Butternut Squash, Bacon and Goat Cheese Spanish Tortilla was a huge hit with everyone, and I’m sure it will be with you and yours as soon as you make it! Now that the holidays are fully upon us, I know that you’ll have plenty of opportunities to whip up one (or many) of these in the month to come. With a little bit of prep the night before, you can have a hot, well-balanced breakfast on the table for your houseguests in less than 30 minutes, leaving you more time for coffee and meaningful conversation. Because isn’t that the most important part of the this time of year? Melt butter in a large nonstick skillet over medium heat. 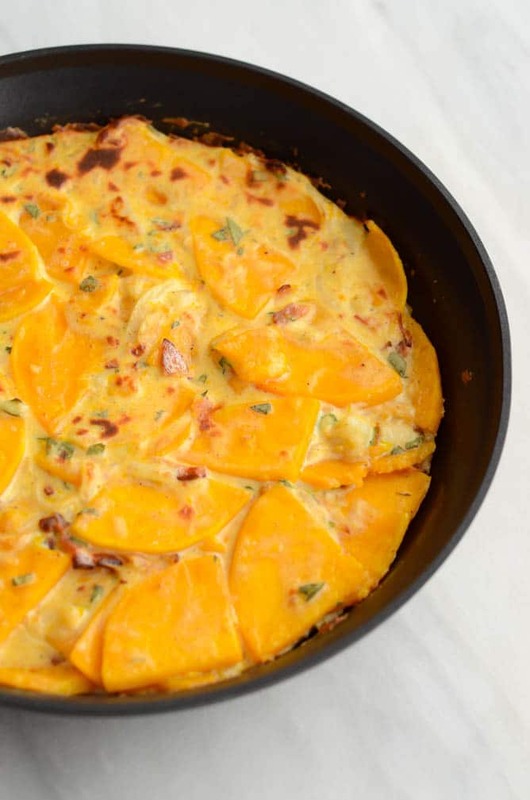 Add butternut squash and onion and let cook, stirring occasionally, until onions begin to turn golden and squash has softened to fork tender. While squash and onions are cooking, combine all other ingredients (except Maldon sea salt) in a large mixing bowl. Once squash and onions are cooked, add them to the mixing bowl, tossing to coat. Transfer contents back to the large nonstick saute pan and place back on medium heat. Let cook, without stirring, until mixture begins to set, and doesn’t jiggle too much when you shake the pan. Turn broiler on high and place nonstick pan in oven. Broil on high for 5-7 minutes, or until the top of the tortilla becomes fully set and golden-brown. Remove from oven (be sure to use a potholder) and sprinkle with Maldon sea salt. Serve warm. The new definition of golden-delicious!